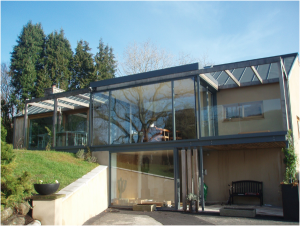 This installation was on new development with the client clearly expressing in the design brief that they required large expanses of glass, with minimum obstructions to their view, from where they would be able to enjoy the countryside views around them. 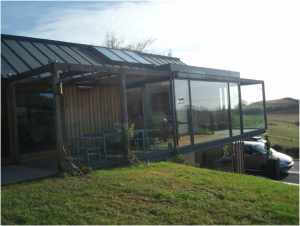 The installation comprised of powder coated, thermally broken, aluminium windows and a sliding door systems with the incorporation of bespoke wooden windows and sliding doors systems. 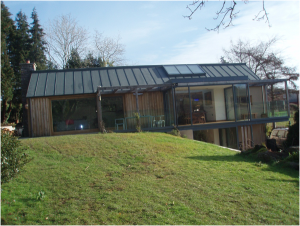 The steel sub structure was manufactured to precise measurements, powder coated and then installed on site, giving the property the required ‘industrial look’ specified in the design of the house. The structure was designed and manufactured, to meet the clients requirements, and they were closely involved at every stage of the process. 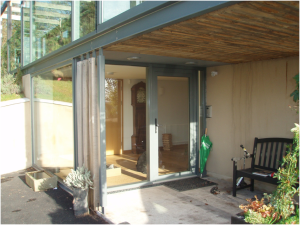 Low thresholds and no steps were incorporated in the design and an access control door entry system was installed which was able to be operated from within a 30 metre radius. 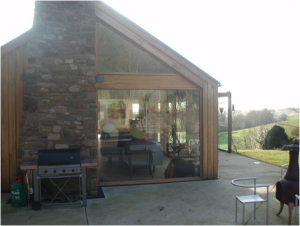 • Glazing conforms to British and European highest standards BS EN 6399 part 1 Section C3 for impact safety and wind loadings. 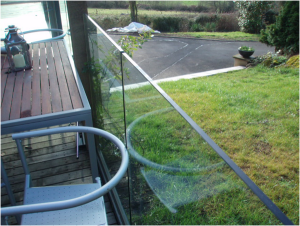 • 15mm toughened glass infinity balustrading set in a British and European channel system. • Timber windows are a Iroko wood with multi-point locking systems coated in clear preservative.